Han Alister thought he had already lost everyone he loved. But when he finds his friend Rebecca Morley near death in the Spirit Mountains, Han knows that he must save her, no matter what the cost. Nothing can prepare him for what he discovers: the beautiful, mysterious girl he knew as Rebecca is none other than Raisa ana’Marianna, heir to the Queendom of the Fells. Han feels betrayed, but if he is to fulfill his end of an old bargain, he must do everything in his power to see Raisa crowned queen. Meanwhile, some people will stop at nothing to prevent Raisa from ascending. With each attempt on her life, she wonders how long it will be before her enemies succeed. Her heart tells her that the thief-turned-wizard Han Alister can be trusted. She wants to believe it―he’s saved her life more than once. But with danger coming at her from every direction, Raisa can only rely on her wits and her iron-hard will to survive―and even that might not be enough. 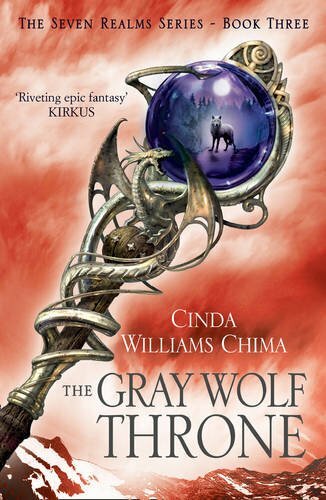 The Gray Wolf Throne picks up not long after the end of The Exiled Queen (please be aware that this review will include spoilers from previous books) and jumps straight back into the action. Raisa managed to escape the Bayar twins but she is far from safe, she's completely alone and trying to remain hidden while desperately hoping her allies find her before her enemies do. Raisa knows that returning home will put her in danger but if the rumours are true and the queen is about to name her sister Mellony as the new princess heir Raisa will have to risk going back to protect what is rightfully hers. While Raisa tries to decide between waiting for help or facing the journey alone Han is also travelling the same path, the clan agreed to pay for his schooling on the condition that he fought on their behalf when they needed him and they've called in his debt. Han knows Raisa as trainee soldier Rebecca, not as Raisa the princess heir, but when he finds her gravely injured he puts his own life in danger to protect her. How will he react when he discovers her secret though? Especially when he blames the queen for the deaths of his mother and sister? Things are about to get a whole lot more complicated, especially when Raisa discovers just how badly her family has been betrayed by the high wizard. Now Raisa has no choice but to face her enemies but it's very hard to tell who she can trust to have at her back. It's getting so hard to write reviews for this series because I just want to talk in great detail about all the amazing things that happened in this book but I have to keep it vague because I don't want to spoil it for anyone. These characters have come such a long way since we first met them though, Raisa is acting more and more like a queen every day and I love how brave and determined she is. Nothing will stop Raisa from claiming what is hers and her enemies had better watch out. Han has started to think before he acts which makes him a much more formidable character, he's good at plotting and he definitely knows how to make an entrance which is something we see in spades when he helps Raisa attending a very important event. I love seeing the strong bond of friendship between Han and Dancer too, Dancer has been through a lot but he's starting to carve his own path and I like the fact that he's not willing to just do whatever the clan want him to. Amon is still one of my favourite characters, he's so selfless and he constantly puts Raisa's needs before his own. There were a few moments between him and Raisa that really broke my heart here so even though I've really grown to love the romance between Han and Raisa I'm still half on team Amon. Even though I know it's impossible for Amon and Raisa to be together I just can't help wishing for it. I just hope that we get to see Amon find real happiness before the series ends, not just settling for Annamaya because he can't have Raisa - that doesn't seem fair either to him or to Annamaya. I don't want to say too much more about the plot but there is a LOT going on in this book, it's kind of hard to keep track of all of Raisa's enemies at this point but there are a few people who I definitely want to see suffer in the next book. This series just gets better and better with every book, I love this world and I'm really invested in all of the main characters so I can't tell you how relieved I am that I don't have to wait for the final instalment to publish! I'm excited to see how the series ends but I'm also kind of dreading The Crimson Crown because I don't want this journey to be over.